Sheffield Eagles' Oscar Thomas celebrates a try against Leigh. It might have been tough on the field, but off the field Sheffield Eagles say they are pleased with the initial move to their new home at the Olympic Legacy Park in the east end of the city. Victories may have been hard to come by on the grass, but the Eagles won their race to return to the Steel City and have overcome various obstacles – including some heavy early season snowfall – to provide a suitable temporary version of the OLP before its completion some time in 2019. “We have some ups and downs since we came home,” he told The Star. “Obviously the snow really had a big effect on two of our games, although we did manage to get the Batley game on. “Generally we are pleased with the way things are going, we feel things are falling into place nicely. “We are working well alongside the council, the UTC and Pulse who operate the site - we are forming some good partnerships which is great. “We are finding our feet now, we need to further market the games if we can, whilst the Leigh game was disappointing, we have had some positives here with running Batley close and beating Rochdale. The site will be developed by the Scarborough Group who have agreed to house the Eagles as part of their planned development of the stadium. 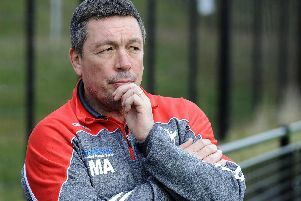 The Eagles are in their hands regarding time scales, but Claffey says they have been encouraged by what they have been told which will see the club eventually be able to make full use of their return to the city. “We have spoken with Scarborough Group over the last couple of weeks and we have been getting updates from them, and we have also had updates from the council” he added. “We have seen some initial designs for the stadium and they look great. “We are happy with what we have seen, and they have earmarked space for us in the completed stadium with potential for a club bar, some office space and the stands meet all of our needs and then some. “It is looking positive, and we’ll get there. “Moving forward it isn’t just ticket sales, we need revenue from other match day areas such as car parking and food/drink sales. “We are feeling positive that we will get that” said Claffey. The Eagles face Rochdale Hornets, in Lancashire, on Sunday. Eagles are third from bottom - Hornets second but have a game in hand.